We heard through the grapevine that Marvin has topped the list. 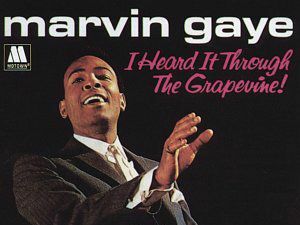 Marvin Gaye's version of I Heard It Through The Grapevine has been voted the greatest Motown song of all time. The song, which was co-written and produced by Norman Whitfield, heads a list that was compiled to celebrate Motown's 50th anniversary, and forms the basis of the tracklisting for the new Motown 50 compilation album. Coming in at number two is Diana Ross's take on Ain't No Mountain High Enough. Ross and Supremes songs feature heavily throughout the top 50; in fact, so many of them charted that the tracklisting for the compilation doesn't exactly mirror the poll results (if it had, this would almost have become a Diana Ross/Supremes best of). Other than Gaye and Ross, the only other Motown star to make the top 5 is Stevie Wonder, with Superstition being his fans' favourite. The Motown 50 album will be released on 1 December 2008. As well as the top 50 songs, it also features a selection of hard-to-find cover versions by Motown artists.